Can you believe we are already in October? If the rush to the end of the year is getting you down, then why not take a few minutes and enter for a chance to win some amazing prizes on Online Competitions. Are you dreaming of a holiday? Do you want to update your home? Do you want the latest bit of tech? Well, enter for a chance to win R10 000 cash and you could do the things you have been dreaming of. The competition closes on the 10th October 2018, so hurry and get those entries in by clicking here. Do you love listening to music on the go from your phone? But are you tired of cables always getting tangled and in the way? Then you need to enter to get your hands on these Bluetooth airpods. The competition closes on the 12th October 2018, so if you want to enter click here. Do you have Apple products? Do you want to get some new accessories to give your devices a fresh new look? You could get your hands on a R500 Apple Store voucher and spend it on anything you like. The competition ends on the 12th October 2018 and to enter you just need to click here. Do you love to play games on your device? Do you love fun and cool apps that let you do more? Or maybe you just want to listen to the latest tunes? 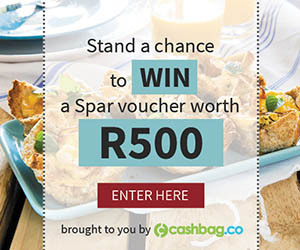 Win a R500 Play Store voucher and spend it on what you want. The competition closes on the 12th October 2018, so click here to enter. Whether you are entering for yourself or that special lady in your life, this R1000 Wonderbra voucher will be greatly appreciated. Don’t forget that October is Breast Cancer Awareness month, so make sure you support the cause. The competition closes on the 16th October 2018 and you just need to click here to enter. You will never miss a beat again when you enter for a chance to get your hands on this Bluetooth speaker that makes listening to your favorite tunes a whole lot easier. Get your entries in before the 18th October 2018 to stand a chance of winning. Enter by clicking here. Are you feeling the year end mad dash to get everything done? Then you need a laptop that is able to keep up with your demanding life. Get your hands on a new laptop worth R5000. The competition closes on the 22nd October 2018 and to enter for this awesome piece of tech, you just need to click here. Are you craving a burger? Or maybe you want some nuggets? Whatever you want, you can indulge your taste buds this month when you enter to win R500 to spend at McDonald’s. The competition closes on the 25th October 2018. Click here to enter. So the price of petrol is on the rise, which means you should definitely enter for your chance to get your hands on a R2500 petrol voucher so that you can fill your tank. The competition closes on the 31st October 2018 and to enter you just need to click here. No matter what your plans are this summer, make sure that you get there and back home safely with this R1000 Uber voucher and you also won’t need to worry about spending your own money on petrol. The competition closes on the 1st November 2018 and to enter, you just need to click here. What would we do without our phones? If you need to upgrade then why not enter for your chance to get one of the best smartphones on the market, the iPhone. You could be getting your hands on a brand new iPhone worth R12 000. The competition ends on the 6th November 2018 and to get your entries in, click here. There is so much to look forward to this month, so make sure you get your entries in so that you don’t miss your chance to win.